Most of the people we encounter each day lead busy lives. We move all day from place to place – we travel from home to drop kids at school, to work, we take public transport, we go shopping, we cook at home, we eat out, arrange meetings, take holidays etc… We engage easily with seemingly mundane everyday activities mixed with special ones, planned as well as spontaneous, routine or one offs, but varied and in many different places combined with responsibilities and choices. Imagine then if for some reason we were suddenly taken out of our busy active lives and put into one place? An unfamiliar place that we did not leave. A place where we stayed all day and all night, and mostly spent the time indoors? The constancy and unchanging nature of the place would be stifling and desperate. This is an extreme scenario as we age gradually and life slows over a long period of time, but imagine the feeling of being locked in to an environment that you knew you could never leave? A place you could check in any time you wanted but you could never leave? A nursing home is not as fun as the Eagles version of one would be in ‘Hotel California’ but I like to imagine a nursing home designed as a place that is not bound by convention and safe formulas. A little hedonism and eccentricity could go a long way. We have many senses but the 5 main ones we are most familiar with help us to read and interpret stimuli from our everyday environment to help us understand and know how to respond. Our senses work because they are active and used all the time – but if they cannot be fully utilized they will dull and weaken. As we age, our senses naturally start to fail, hearing and sight can be lost or restricted, our balance goes in all directions but much research indicates that our last sense to fail is that of touch. When we have to live in an indoor environment, one programmed for constancy and ‘comfort’, an environment dependent upon artificial lighting and ventilation, where everything is kept sterile and safe, clad in the unnatural feel of smooth plastic and vinyl, then what do our senses have to respond to? Where are the delights and the ‘knowledge’ of the changes we know in our world? We design to include a textural interest, acoustic treatments but also to invite the positive sounds of nature, water, children’s laughter and birdlife. Calder Flower Architects are heavily focused on sustainable design – obviously to reduce the negative impact of building on the environment and to consume less energy and water etc – but equally important is the quality of the indoor environment that this embodies. Using fresh air and natural ventilation, opening doors and windows to the outside instead of relying on air-conditioning connects the inhabitants with the outside world. The connection is familiar and human – we can smell the rain, feel warm breezes, hear birds and crickets. Even if it is slightly uncomfortable – too cool or too hot or humid – we need that to feel alive. 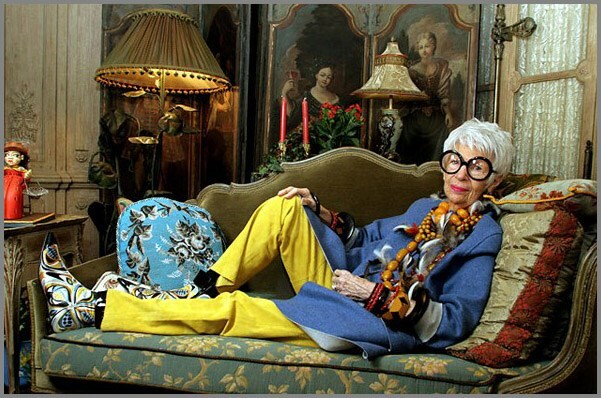 Image: Iris Apfel who is an American businesswoman, interior designer, and fashion icon.